Northwell Health, New York's biggest hospital system, is shutting down its insurance operation after suffering major financial losses in 2016. Northwell said Thursday it will wind down its insurance business, CareConnect, and exit New York's Affordable Care Act insurance marketplace over the next year. CareConnect covers about 13,000 members on the exchange. "It has become increasingly clear that continuing the CareConnect health plan is financially unsustainable, given the failure of the federal government and Congress to correct regulatory flaws that have destabilized insurance markets and their refusal to honor promises of additional funding," Northwell President and CEO Michael J. Dowling said in a statement. CareConnect, which was launched in 2013 and covers about 126,000 members, recorded a net loss of $157.9 million for 2016, even though its premium revenue jumped to $360.8 million from $127.5 million in 2015, according to regulatory filings. Northwell blamed the loss on the ACA's risk-adjustment program, which required CareConnect to pay $112 million for 2016, compared with $11 million in 2015. In the Thursday statement, Northwell said CareConnect would be profitable this year if it did not have to make the risk-adjustment payments. The $112 million bill amounts to about 44% of the company's small-group health plan revenue, it said. CareConnect also said it would be facing risk-adjustment payments of more than $100 million in 2018. Northwell said CareConnect operations would continue over the next year as the company works with customers and businesses to transfer policyholders to other health plans. In a statement, Maria Vullo, superintendent of New York's financial services department, said the state's health insurance marketplace remains "robust" despite CareConnect's withdrawal. 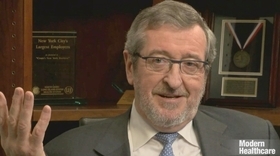 "While it is unfortunate that the continued uncertainty across the nation due to the repeated actions of the federal government to undermine the Affordable Care Act at this time in the insurance cycle has caused CareConnect to begin an orderly wind down from the market, we recognize that this decision will help Northwell focus on its core mission to deliver healthcare services to New Yorkers," Vullo said . An​ edited​ version​ of​ this​ story​ can​ also​ be​ found​ in​ Modern​ Healthcare's​ Aug.​ 28​ print​ edition.